The procedure for receiving new dentures usually involves many steps; these will vary depending on the variation of denture selected and whether you require preliminary treatment. First, your dentist will record measurements and take impressions of your mouth, ensuring that your appliance fits and functions perfectly. Then, any remaining teeth will be extracted from the area if receiving a full denture is part of your treatment plan. Those who are receiving an implant-supported denture must have their implants positioned before the permanent device is placed. Once your mouth has fully healed from the preparatory treatment, your permanent appliance will be set in your mouth and corrected for comfort. What Are the Main Varieties of Dentures? When considering getting dentures in Haverford, you will have many options to choose from. Your dentist will help you determine which type of affordable quality dentures will best restore your smile. Sometimes referred to as a “complete denture,” a full denture is used when a patient is missing most of his or her teeth. They can also be used when multiple teeth are severely damaged. To receive this type of denture, each tooth in the affected area will need to be extracted. A full denture can be removable or permanently held into place with dental implants. They’re constructed using durable, natural-looking materials like acrylic and porcelain. Those who are only missing a few teeth may qualify for a partial denture. These appliances are similar to a bridge because they consist of a row of artificial teeth held in place by the adjacent teeth. To clean the partial, you’ll simply unhook the clasps on either side of the appliance. Created using lightweight, natural-looking materials, flexible partials are a discreet way to replace missing teeth. Flexible partials adapt to your mouth as it moves, allowing you to chew and speak comfortably. They also feature gum-colored clasps for a realistic look. Unlike a traditional denture that sits along the gum line, an implant-supported denture is secured using one or two pairs of dental implants. With an implant-supported denture, you can achieve a secure hold without the use of sticky bonding agents. These appliances are usually recommended as lower dentures; the upper jaw doesn’t typically need the enhanced stability. The cost of getting dentures created depends on multiple factors. The type of appliance selected, the preparatory treatment needed, and the items used to craft the dentures will all factor into your charges. Please call us to schedule a consultation where your dentist will evaluate your condition and explain your potential charges. What Is a Denture Device? Dentures are an easy-to-use and effective treatment for missing or heavily damaged teeth. Custom-made to fit your mouth, these appliances consist of artificial teeth and gum tissue attached to a titanium frame or fixed implants. Wearing dentures can significantly improve your speech, chewing ability, and self-esteem. Why Do Patients Receive a Soft Denture Reline? If you’re suffering from sore spots created by denture wear, a soft reline can restore comfort to your appliance. During this simple and affordable treatment, the dentist will resurface your denture with a soft, pliable material. With a reline, your denture should remain comfortable for approximately two years. 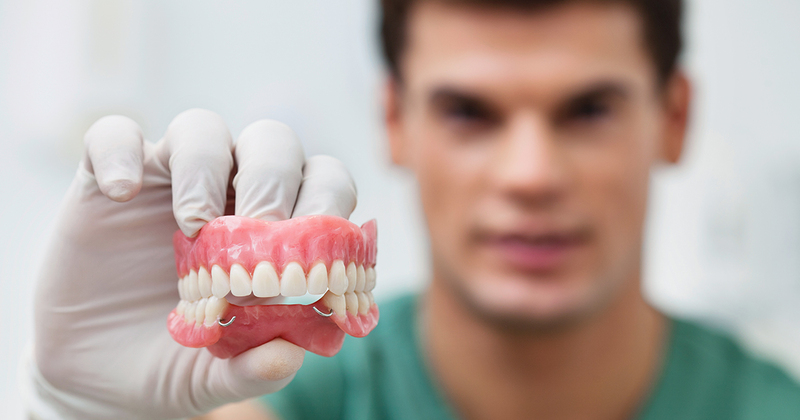 Are All-on-Four Dentures Better Than Regular Dentures? A new approach to denture implants, All-on-Four dentures allow you to receive a complete arch of pontic teeth using four dental implants in the lower jaw. This permanent denture option provides patients with a secure fit and excellent power when biting. Contact us now to see if this option is right for you.